I know I have only touched on the theme of play from my first course, but I have started my second which is entitled "Learning Centers." I thought I would learn a few things here and there, but I am on page 17 and I want to go into my classroom and totally transform it. I have found this so inspiring and I just need to share. Again, it could be done in a thesis paper, but I will try to split it up. (I tried sharing with my husband, but he just can't seem to muster up the enthusiasm I am looking for). The magnificent author of this course, Maxine Edwards Cornwell, is able to write and relate to the reader so tremendously. I can't praise her enough. Ms. Cornwell began the course by explaining what a learning center is, the benefits, how to present them to children, and some developing techniques. I will come back to these later. She then goes on to explain children's characteristics and our roles as educators to help children learn by planning centers around HOW children learn. She lists ten characteristics of children, differentiating them from adults, and helping the educator to focus on these characteristics to benefit children's learning. "1. Physical development in the most important part of a young child's life. 2. A young child's need for emotional security is greater than at any other time in their life. 4. Young children have very little experience, but a huge desire to learn. 5. The child is forming a self-concept that will last a lifetime. 6. Language development in the early years is critical. 7. Young children are illiterate--they can not read or write yet. 8. Curiosity and creativity are present in every child. 9. Children live in a fantasy world, they use their imagination to help them make sense of the confusing things they see and hear. 10. Children learn through active interaction with real objects--not just hearing about them." She then goes on to take each characteristic and develop a learning center that is going to help the child grow and benefit concerning that area. I will tell you the one I read today pertained to characteristic number 4. I was so excited I was ready to go! Ms. Cornwell said, "Since children have very little experience, we need a fingerpaint center" I'm like, WHAT? But as I read on I was like, WOW! She believes the fingerpaint center is the second most important center (after blocks) in a school. It is a center where practice is rewarded with success and further practice is encouraged. One thing she says which makes perfect sense, but doesn't often come into thought--we encourage the development of fine motor skills, but this depends upon the development of gross motor skills, this center is going to provide that. The child uses back and shoulders, whole arm, forearm, hand, and fingers. It is an open-ended activity that allows a child at any stage of motor development to practice, grow, and succeed. 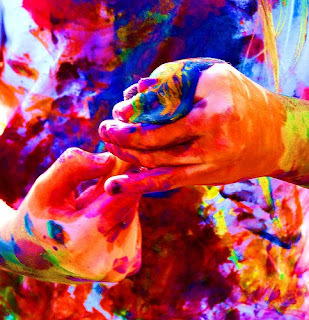 There is no wrong way to fingerpaint, every child is a success at fingerpainting. Fingerpainting does not mean you have to use just paint. Anything messy is fun; shaving cream, pudding, wallpaper paste, whipped cream--anything you're imagination can come up with. Also, she suggests not using paper--do it right on the table, or some type of cafeteria tray, but make sure the area is big enough for large movement. She explains that the tabletop is the best area--large, no limitations, and can be cleaned up pretty easily. Plus she says the clean up should be part of the children's job too. Spatulas to scrape the paint into the trash, soapy water to wash the tables, towels to dry the table. To them this is as much fun as the fingerpainting itself. As with any learning center it is the process rather than the product, so you don't need paper. She suggests if they would like to have some art work, make a print. Allow them to experiment then lay paper over their creation, press on it and pull it up, creating a wonderful print. Also, providing classical music in the area adds a multi-sensory aspect and can result in some beautiful creations that may have not been experienced without the music. Finally, yes, there are the children that don't enjoy getting messy. For this you have the "get acquainted principle." The center is available and open for the children to slowly experiment at their own comfort level. She believes that you have to start this early. "Remember how babies love smearing oatmeal all over the high chair? Children love the feel of being uninhibited and messy. We need to keep provide these types of experiences so that the children don't have a fear of getting messy or dirty." At first I thought, yeah right, like I can do that mess everyday. As I read I became more excited to let the children experience this and grow in this area of success and gross motor development. I know I have probably missed this for this year, but I hope to incorporate this activity more next year. Happy mess! Ohhh...please share more! Sounds amazing! Thank you for posting all you are learning from these courses. I am all ears!! I think learning from our peers is the best!! Thanks girl!! i had a cluster of boys cleaning dried glue off of our project tables....and you are right, that seemed as good as any project! Thanks for posting. This is great! We are going to fingerpaint on the table tomorrow! Wonderful stuff. I am new to your site. Loving it. IS this a college course? Or is it something we can find? To Amy L--I'm glad you have found the site and are finding it useful. I received the courses from a place called Care Courses--carecourses.com. I love what you have posted as well!!! I have a question, my co-worker is teaching pre kinder getting them ready to go this sept, she uses SO MANY worksheets and not enough hands on things in the class. I have mentioned it to her that they need it, they need the easel up in the class, they need the sensory table open at all times, they need an art center, she says she never has time to do those things. i told her i would help her. i have mentioned it to my boss and she says the worksheets are good and she has noticed what i have noticed as well, but she says this to all of this: whether the kids experience these things now doesn't really matter as long as they are getting the fundamentals because they are still going to kinder. I have a HUGE problem with this, my daughter will be going into her class in sept, she is in mine right now, and i am the messy teacher and so hands on the kids and parents love it and me, so what can i do? Great site! We do lot's of messy activities, but I never thought of a fingerpainting center....I love it! I will be setting that up today! !